The 2013 Trek Lexa SL Women Specific Road Bike. Scheller's is all about helping our lady customers become cycling enthusiasts. 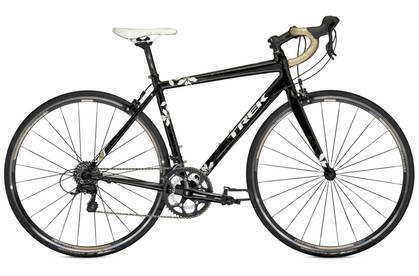 Trek continuously offers amazing, quick, and dependable road bikes for women, and the 2013 Lexa SL is no exception! Trek decided to use the H3 WSD fit on this bike, which means it has a slightly higher head tube, as well as a slightly shorter top tube so you can ride for longer yet feel just as comfortable. 100 Series aluminum has been molded into complex tube shapes that give the rider a great combination of strength and weight. The compact crank offers enough gears for you to be comfortable on any ride, while at the same time saving weight that is all important when trying to get moving. Comfort is one of Trek's top priorities, and this is illustrated by their use of Women's Specific Design in their road and mountain bikes. Trek knows that a great-fitting bike means more joy from the ride, and they have designed their WSD bikes to offer reat comfort, excellent power and stability, and awesome control. Shimano STI shifters and brakes allow you to have complete control over the gears while maintaining your ability to brake if needed. Shimano Tiagra derailleurs provide compatability and a sure, swift shift every time. Trek uses a Bontrager Affinity 1 saddle, a 20mm offset Bontrager Race seatpost, and Bontrager Gel Cork tape on the bars to keep you comfortable on the ride. Even long rides won't be an issue as a result of your sit bone and hands being gently cradled by the comfy yet firm Bontrager components.